Santa Clara, Calif., September 18, 2012 – Coherent, Inc. (Santa Clara, CA) (Nasdaq: COHR) has extended its integrated laser machine tool product portfolio with its new META platform, offering improved performance and greater ease-of-use. 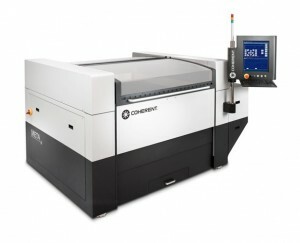 Santa Clara, Calif., September 18, 2012 – Coherent, Inc. (Santa Clara, CA) (Nasdaq: COHR) has extended its integrated laser machine tool product portfolio with its new META platform, offering improved performance and greater ease-of-use. The META platform features a unibody chassis design. This rigid, single weldment provides improved mechanical stability for the system, resulting in faster cutting speeds and better positioning repeatability. In addition, the cutting bed on META platform products has been enlarged to accommodate standard European sheet sizes (1.25 m x 1.25 m). The control system has also been significantly upgraded. Specifically, the operator interface for META platform products has been changed to an industrial type controller. This is an ergonomic monitor/keyboard assembly which is directly mounted on the side of the chassis. All interface cables for this system are now contained within the machine assembly, further enhancing its ruggedness and suitability for the increasingly industrial environments in which the platform is now being utilized. Improvements have also been implemented in the META platform’s software. In particular, ease-of-use has been enhanced through a new, multilingual software interface, together with the implementation of greater system automation. Additionally, the system features automatic focus, advanced capacitive height sensing and a fully integrated machine vision system. When configured with a Coherent 1 kW CO2 laser (Diamond E-1000), the META system offers unmatched flexibility, with the ability to process a wide range of both metals and non-metals, such as plastics, wood, fabrics, leather, paper and thin films. With this laser, the system can readily cut stainless steel in thicknesses of up to 3mm, aluminum of up to 2 mm, and mild steel of up to 6 mm. Founded in 1966, Coherent, Inc. is a Russell 2000 Index company and a world leader in providing laser-based solutions to the commercial and scientific research markets.